A 1.5 hour class to work out the core and stretch out every part of the body! Begins with 15/20 mins of head to toe stretches adapted from gymnastics and yoga. Followed by basic tricks on the hoop with variations adjusted to the comfort of the students. These tricks are fun and progressively challenging! Concludes with 15/20 minutes of conditioning, involving core workouts with the hoop and the students body weight as well as other free body exercises to develop strength. A 1.5 hour class for kids to work on flexibility and strength in a fun and playful manner. The class will be broken up into; the warm up which includes head to toe stretches, partner assisted stretches, followed by basic tricks on the hoop progressing to creating their own shapes on the hoop, and endin with conditioning which includes exercises to engage the core and strengthen the body overall. 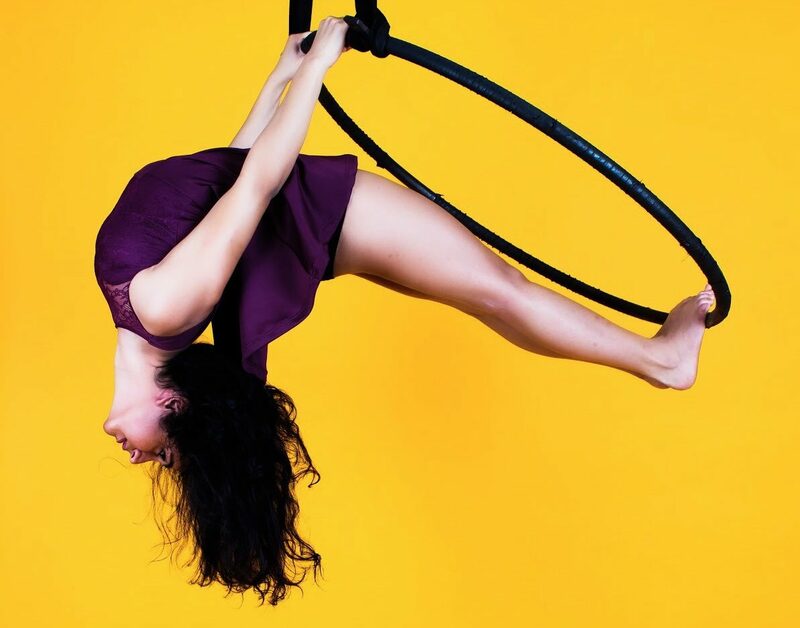 The workshop will end with a 30 second routine to showcase their new skills on the aerial hoop! A 1.5 hour class to work out the core and create a basic flow/routine with the partner. Begins with 15/20 mins of head to toe stretches adapted from gymnastics and yoga. Followed by basic tricks on the hoop simultaneously performed by the partner. Initially the tricks are independent of each other, but end up with carrying the weird of one another, creating a ‘flyer’ and ‘base’ relation. This relation depends on strength and flexibility of the partners! The aim is to create a 30/45 second flow together. This class also ends with conditioning involving core workouts with the hoop and the students body weight as well as other free body exercises to develop strength. 1) If you come with a partner for partner hoop, you can sign up together with the eight class pass! 2) Parents are welcome to join their kids in class as well! Parents can avail of shared passes. Register and pay online at http://imojo.in/delhirock. Enter the payment amount manually, and specify which section you would like to sign up for on the following page. We will email confirmation to you upon receipt. Yes, you can pay cash as well at our facility. Online would save that trip for you ma’am! Also, if you pay in advance we can assure you of a spot in the class.